Every Nonprofit organisation, that deals with any kind of activity, has to be governed and controlled by a Board comprising of people in the organisation. They have to meet occasionally as the situation demands, to discuss certain issues and take decisions accordingly. For this purpose, and also to ensure that the meetings go off smoothly, it is best to have an agenda prepared in advance. The agenda dictates what all will transpire in the meeting and ensures that people don’t go off-track from the issues at hand knowingly or unknowingly. Below we are the steps on ‘How to Create a Nonprofit Agenda’ and 5+ Best examples of the same. 1. Purpose of the Meeting : This is the most important step. This determines why the meeting is taking place. Decide on the purpose of the meeting. 2. Circulate the Purpose of the Agenda among the attendees to ensure all points of importance are covered. Edit the Purpose List in case new points emerge from the feedback received. 3. Decide on the activities that will be undertaken within the purview of the Purpose List. Usually, the minutes of the previous meeting are ratified. Old business, new business points are discussed. 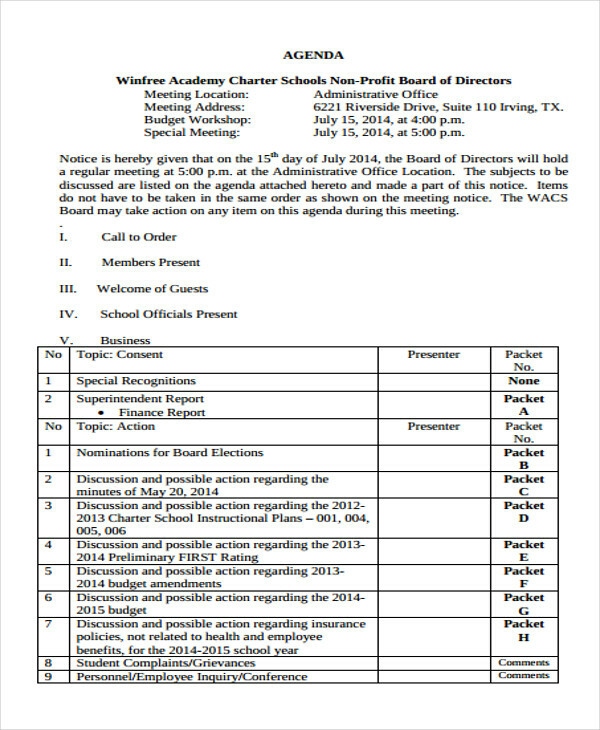 List of items that need to be voted on such as fundraisers etc. needs to be explicitly mentioned. 4. Decide on the time of the meeting and make it part of the agenda sheet. Also, allocate sufficient time for each activity mentioned. 5. You can make use of any of the sample templates given below to suit your needs. Accommodate all the above information for preparing the final draft of the Agenda. 6. Take enough printouts so you can give one copy to each attendee at the meeting. The Chairperson can also choose to circulate the Agenda between attendees in advance if he/she wishes so. 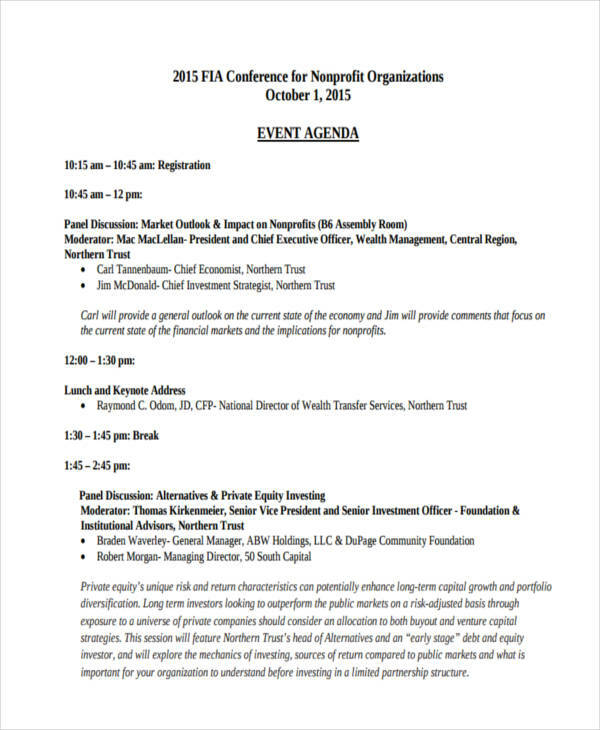 Below are the 5+ Examples of Nonprofit Agenda Examples. 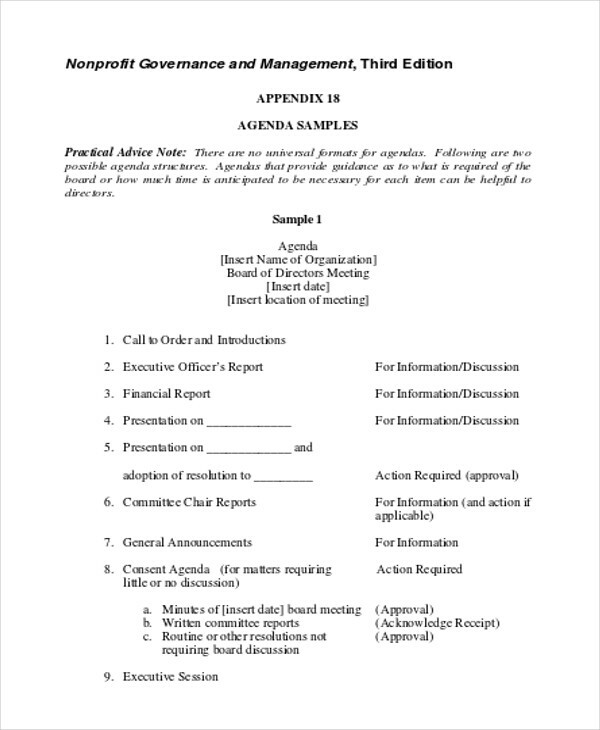 The above template can be used by Nonprofits for any general purpose meeting. It contains all the essential elements that an agenda format should have so you will have no problem organising the meeting when you use this. Its structure will suit most meetings and can be adapted for use accordingly as well. This sample is simple, downloadable and printable as well. 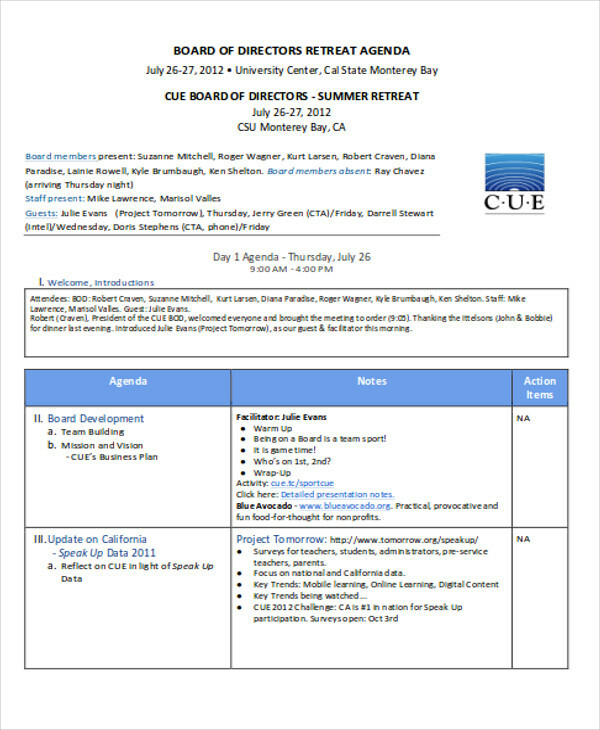 When the Board of Directors is planning for a retreat to raise funds then this sample template can be made use of. It is informative and when followed this will ensure no details are left out. A Nonprofit can certainly benefit from using this to ensure maximum participation by the general public so that your retreat event can turn into a huge success. The above sample template is very simple and easy to understand. It is free to download and is in a printable format. To plan for the Annual General Meeting of a Nonprofit is a very important matter and to have a comprehensive agenda ready is the main task. A lot of important deliberations go on in an AGM so it is very important that all information pertaining to the events that will take place in the meeting be taken into consideration properly. 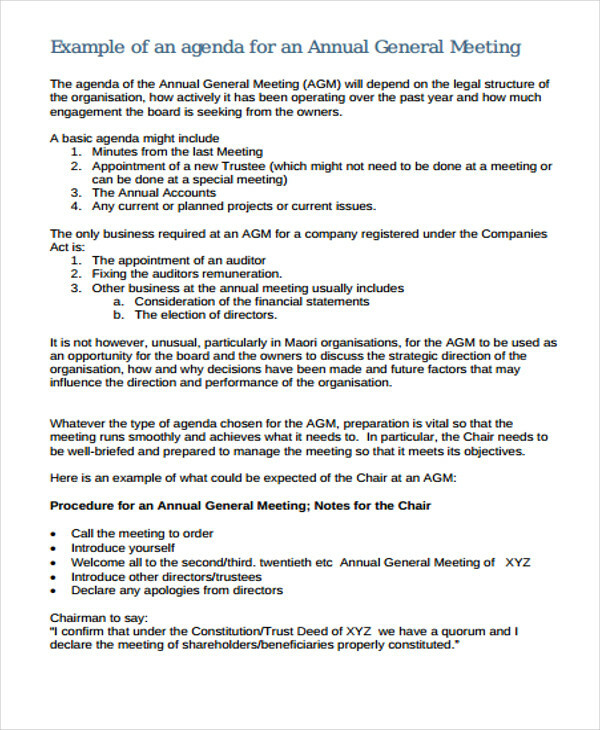 The sequence of events of the AGM also has to be mentioned correctly to ensure it goes off peacefully. The above template is a very handy tool, which you can make use of to ease your burden. It is a simple and self-explanatory document. It is free to download and is printable as well. When the Board of Directors meet for an informal discussion then this template can be made use of. This is exhaustive and one can easily understand its purpose upon going through it. It is in a format that is mostly used in such cases and is an excellent example of this kind of use. It is downloadable, free and printable. Make use of this for creating a great impression on the Board of Directors of your Nonprofit. 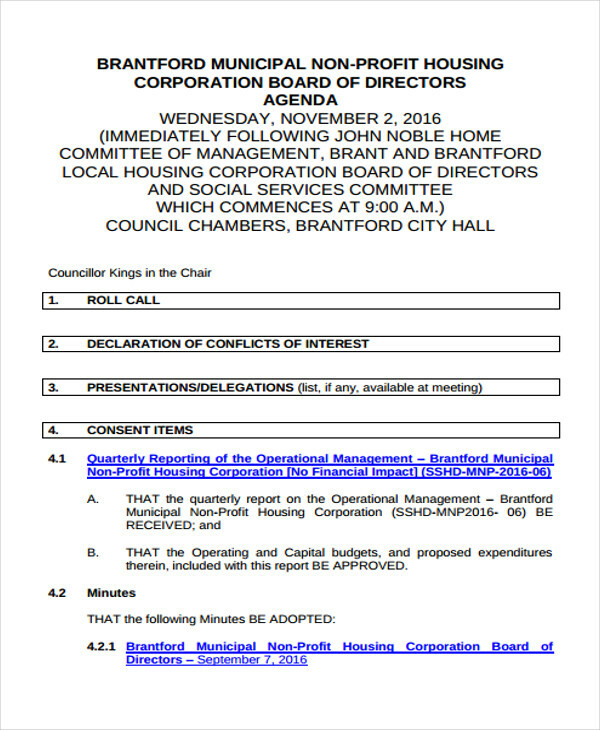 When a Board meeting is being convened by the Directors, it is a very vital event and in that case, a good agenda document is very helpful in ensuring a good and productive Board meeting. Certain legal requirements are to be kept in mind in case of such a meeting and this document is appropriate to that. This sample template is very easy to understand. It is free to download and printable as well. When your Nonprofit is planning a fundraiser event then it is important to plan for it properly. A meeting that helps solve this purpose with a suitable agenda is a must. The above document template aids you in ensuring that your meeting will be successful and worth the time and effort. Make use of this template for great results in the meeting and at the event thereafter as well. This sample is very easy to understand. It is free to download and is printable as well. 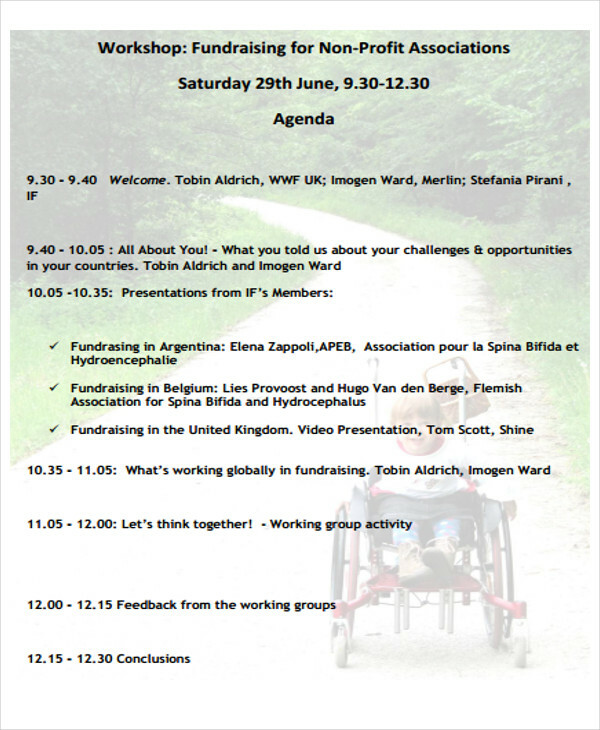 When an event being organised is not a fundraiser, then certain important aspects are required to be discussed. Since different events have different objectives, it is important that a suitable agenda is drawn up to ensure a quality meet is conducted and all business can be taken care of meaningfully. The above template will help you achieve that. It is in a very simple format and is free to download and print as well. Make use of this template for best results for your meeting.